Melt 8 oz of good chocolate either in the microwave or on the stove. If you are making these with a child make certain to pour the hot melted chocolate into a cool bowl before you start dipping. 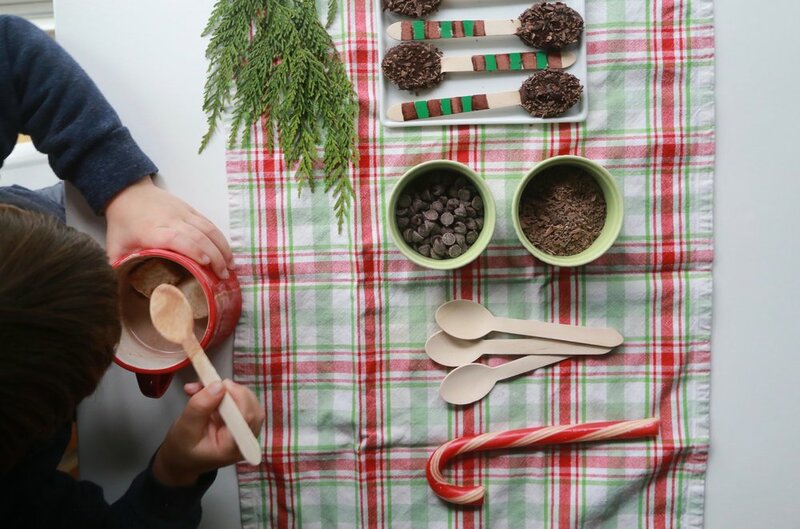 Take your wooden spoons and dip them into the melted chocolate. Coat heavily. Before the chocolate cools sprinkle the chocolate covered spoons with your favorite toppings. This could be shaved chocolate (like we used) crushed peppermint or mini marshmallows to just name a few. Wrap in a cellophane bag tied with a bow and make certain to include a jar of your favorite hot cocoa. If you want to give a more elaborate gift throw in some homemade marshmallows and few special mugs. These homemade stir sticks are easy to make and just about the perfect gift for anyone special in your life.